This procedure has only been tested with N1MM Logger v7.0.0, PowerSDR v1.10.1 and N8VB vCom v1.0.0.4. It works on a Pentium 3D PC with 1Gbyte of RAM and Windows XP Professional box. 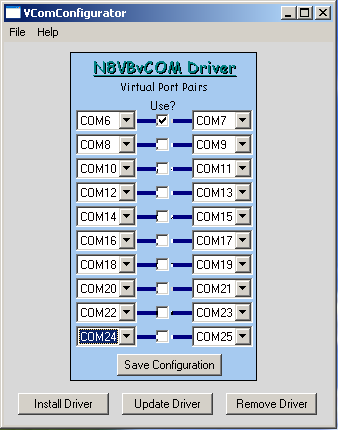 For this example PowerSDR uses COM6 and N1MM uses COM7 for the virtual port pair. Any other valid vCom pair may be substituted. See the example below. Step 2. Setup PowerSDR's end of the PTT Serial port connection. In the PTT Control Panel, select Port COM6 and leave the RTS and DTR check boxes blank. In the CAT Control panel, check the Enable CAT box. Click on OK when complete. See example below. Verify communications by selecting various frequencies in PowerSDR's VFO A window and verifying the same change in Logger's blue Title bar. Step 6. Assuming basic CAT communications has been established; enable PowerSDR to process "paddle closures" from N1MM Logger. In the Secondary control select CAT. PTT Line and Key Line controls will appear. Leave all other controls unchanged. Click F2 and observe the CW being sent by your SDR. With MON activated listen to the code quality. Assuming you can hear the code and appropriate power is being generated you are done. Select "None" in the Keyer Secondary Port box. Terminate N1MM Logger and activate your normal CAT program. There is one remaining issue. That is insuring smooth CW transmission. Assuming on contest day there will be several programs running on your machine, application priorities must be set appropriately. Start with all applications at normal. In the PowerSDR menu bar, navigate to Setup -> General -> Options and select a Process Priority of High. Leave all other tasks at a Base Priority of Normal. The resulting performance is solid at least through 30wpm. But be forewarned, this configuration has not been tested under the combat conditions of a real CW contest. NOTE: I've been hearing from a few hams who have the interface working but are still having some problems getting smooth code. All the reports were from people running single processor CPUs. Article has been viewed 10,396 times. Execution: 0.625. 9 queries. Compression Disabled.